Ultimate in extravagance luxurious Sinamay dome shaped silhouette luxurious sinamay. Intricate demure flying feather butterflies and main floral with feather petals and quill arrangement. Body shape slightly dome lamp shade for the a dramatic look, tone on tone hatband. 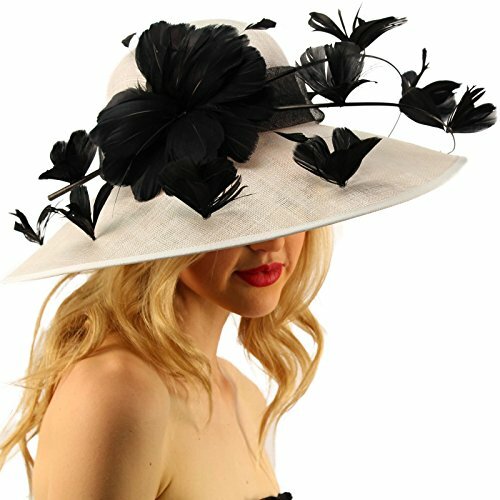 Best of classic old world fashion, passionate silhouette with a flair. Position the hat anyway you like. Make your own fashion statement. Great fresh look for the season. So glamorous and so comfortable. Feel like royalty in an instant. Great for multiple seasons. Will compliment any outfit. You will surely win the derby hat contest. Front brim 6" Back brim: 5" crown height: 4-3/4" Total height 7-1/2"
Floral and Feathers arrangement: 7-1/4" x 20" Feather Petals: 6" x 7" Feather butterfly: 2-1/4" x 2-1/2"
Occasion: Extravagant fancy formal black tie event, a tea party, cocktail hour, charity gala ball, award ceremony, theatre, play performances, horse races, Kentucky Derby, Grand National, Melbourne Cup, weddings, church, baptisms, christenings, bar mitzvah, bat mitzvah, funerals, religious gatherings. Bridal, brides maid, maid of honor, mother of bride or groom. Perfect for vacation and cruise attire. Illuminates your facial silhouette beautifully. If you have any questions about this product by SK Hat shop, contact us by completing and submitting the form below. If you are looking for a specif part number, please include it with your message.